While developed countries have enjoyed access to reliable electricity for nearly a century, energy access across the world remains one of the greatest challenges of our time. Globally, over 1 billion people still live without access to electricity today, putting them at a major developmental disadvantage. It has been shown that access to energy stimulates economic activity in a virtuous cycles: communities with power enable children to study during the night hours with electrical lights, community can charge cell phones to stimulate their business activities, and households can in many cases maintain appliances that raise their standard of living. Recently, the idea of a microgrid, a self-sufficient energy system that can operate independently from the larger grid has been receiving more and more attention due to its capability to address energy access challenges, especially in remote rural regions where grid development can be both economically and technically challenging. Microgrids have also gained popularity in developed nations, as they allow for greater independence from the larger electricity grid which can lead to more reliable energy infrastructure for the microgrid user. These types of systems are sometimes also referred to as distributed generation systems, as some of them cannot operate as an “island” grid on their own. The scale of energy access challenges are immense, extending from remote rural areas to the urban poor to name a few, and so are the complexities and intricacies of the various challenges. Microgrids provide an additional tool to help address the global energy access challenge and create more secure and sustainable energy infrastructures across the world. This tool, however, has to be completed with smart energy policies, as well as innovative business models and financing schemes to be utilized in an effective manner. The first component needed in any microgrid system is the power source. The energy source is often adjusted for the demands on the microgrid, such as the generating capacity desired, as well as other considerations. 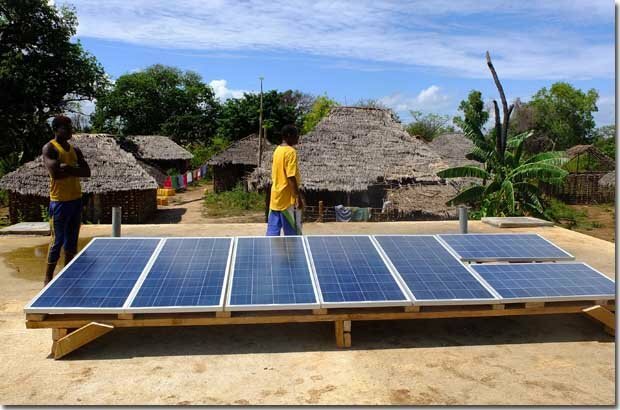 Solar power has been a increasingly popular energy source for remote microgrid providing energy access to rural areas in Africa. Recent price drops in photovoltaic solar power modules have been the economics of solar based microgrids more favorable, and the accessibility of solar energy in Africa further enhances the favorability of using solar power. Some of the primary challenges for solar based remote microgrid are maintenance of the modules, whose performances can decrease significantly when exposed to high moisture levels, as well as the storage requirement that the intermittent source imposes. This is particularly important in economic considerations, as storage systems generally make up the bulk of microgrid costs and more solar capacity requires larger storage capacities. Further power sources that have provided energy areas in remote rural areas include small hydropower stations, as well as wind power. In developed countries many microgrids operate with natural gas as a power source. The power management system handles the transfer of electrical power from the power source to the electricity consuming devices. These type of electric load management usually requires converting the electricity generated from the power source with an inverter that transforms the electricity to the form required for most appliances, such as cell phone or cooking equipment, and interfacing with the storage components of the microgrid to balance the supply and demand loads of the microgrid. Modern microgrid systems often integrate software and control systems, such as smart meters, that can manage the grid operation in an efficient and reliable manner. Storage systems are essential to any microgrid because they allow the microgrid to balance the electrical and thereby make the electricity accessible when it is required by the user. A review of common energy storage technologies for various capacities can be found here. In the case of remote microgrids, batteries are the most common storage technology often because the storage capacity required for the microgrid does not justify the higher cost of other storage technologies. Large-scale storage technologies, such hydro based storage or thermal storage, have high initial costs that make their implementation in remote microgrids challenging. The last component of the microgrid are the electricity consuming devices whose energy is supplied from the overall microgrid system. It is important to consider these devices because they will dictate the electrical loads placed on the microgrid, which in turn will affect the power generating capacity required from the power source and the storage requirements. Charging a cell phone, for example, generally places a small capacity requirement on the overall system whereas connecting a refrigerator to a solar-based microgrid can create difficulties managing electric loads due to the significant constant power demands of the appliance. Many microgrids in developed countries, such as the schematic shown earlier, also have an integrated connection to the larger utility. This connection enables the mirogrid to exchange power with the larger utility network. This type of microgrids with utility connections are common for university or corporate campuses and hospitals. « Why aren’t blacks migrating like they used to? Can you contact me about an idea I have to create a microgrid to provide an income to seniors using their home as a production facility? I am a neophyte on this and I might be out of my mind but I need a short conversation to see if I am on the right trajectory.